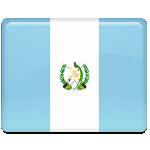 Independence Day is one of the patriotic days in Guatemala. This holiday is annually observed on September 15 to celebrate the day, when Guatemala declared independence from Spain in 1821. The Spanish arrived at the territory of present-day Guatemala as early as in 1519. They began several expeditions and devastation of the native populations. The conquest was headed by Captains Gonzalo de Alvarado and his brother Pedro de Alvarado, the associates of Hernán Cortés. In 1524 the Spanish conquered the K'iche' Kingdom of Q'umarkaj. The main city of Q'umarkaj was burned by the Spanish and by 1524 the Maya were totally subdued. The Spanish started production of gold and silver in the 16th century and established numerous plantations. The Captaincy General of Guatemala was formed in 1564 and Antigua Guatemala became its capital. The capital was destroyed by earthquakes and it was moved to its present-day location. Spanish colonies started the fight for independence at the beginning of the 19th century. Guatemala and other colonies of Central America declared independence on September 15, 1821 and became a part of the First Mexican Empire.